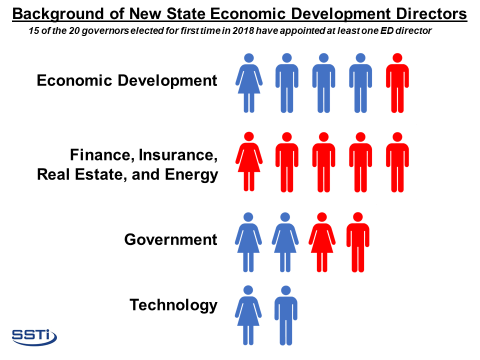 The 20 new governors elected last November are filling out their appointments, and SSTI’s analysis of those named as state economic development directors reveals an array of backgrounds leading into their new roles. New Republican governors have shown a greater propensity to choose a leader with an industry background, while new Democratic governors have been more likely to appoint directors with economic development experience. From a former U.S. representative to the owner of a regional pizza chain, here are the highlights of the 16 state economic development directors appointed since November. Of the 15 economic development administrators named so far, seven come directly from the private sector, with two of those appointees having a background in the tech sector; newly elected Democratic governors appointed both. Half of the new Republican governors appointed an economic development director straight from the private sector. Gov. Tim Walz’s (D) appointee to lead the Minnesota Department of Employment and Economic Development, Steve Grove, recently “boomeranged” back to the Twin Cities after a career with Google. Elements of his vision for the state’s economic development strategy appear in a Star Tribune op-ed. Erin Guthrie, Gov. JB Pritzker’s (D) selection to lead the Illinois Department of Commerce and Economic Opportunity, was previously the Midwestern general manager of Uber. She was a McKinsey consultant prior to her role with Uber. In Alaska, Julie Anderson brings private-sector experience in pipeline management and oil and gas exploration as Mike Dunleavy’s (R) appointee for the commerce, community, and economic development commissioner position. In a previous role that she had with the Alaska Industrial Development and Export Authority, Anderson was responsible for stakeholder management around new pipelines. Tom Kealey, Idaho Gov. Brad Little’s (R) new Commerce Secretary, is a co-owner of Chicago Connection, a regional pizza chain with eight locations throughout the state. He was previously an executive with Morrison-Knudsen, a Boise-based construction company that was once one of Idaho’s largest businesses. Oklahoma Gov. Kevin Stitt (R) has appointed Sean Kouplen as the state’s commerce secretary and workforce development. Kouplen is currently the chairman and CEO of Regent Bank, and he intends to serve in both roles. Brent Kisling was also named as executive director of the Department of Commerce, after previously serving as the executive director of the Enid Regional Development Alliance. The appointed commissioner of South Dakota Governor Kristi Noem’s (R) Office of Economic Development is Steve Westra, an executive with both Hegg Companies, a real estate developer, and Esprit Memory Care, a chain of assisted living facilities. Previously, Westra also served in the state’s House of Representatives and as a member of the Tourism Advisory Board. Bob Rolfe was reappointed by Tennessee Gov. Bill Lee (R) as commissioner of the Department of Economic and Community Development, a position he has held since March 2017. Previously, Rolfe had a career in private equity and was the chairman and CEO of Medical Reimbursements of America. Several state economic development director appointees have direct experience in the field. Democratic governors were more likely to appoint a director with direct economic development experience. California Gov. Gavin Newsom (D) appointed Lenny Mendonca as the state’s chief economic and business adviser, as well as the director of the Office of Business and Economic Development. Mendonca was previously the chair of the Bay Area Council, a private-sector led regional economic development organization. Prior to joining the council, Mendonca was also a partner with McKinsey and a lecturer at Stanford. The new Kansas Commerce Secretary is David Toland, who previously served as CEO of Thrive Allen County, a regional economic development initiative. He was appointed by Gov. Laura Kelly (D). Toland is part of a seventh-generation family of Allen County and returned to Kansas in 2008 after nearly a decade in Washington D.C.
Gov. Janet Mills’ (D) nominee for the Maine Department of Economic and Community Development commissioner position is Heather Johnson, another boomerang turned economic development executive. Johnson previously worked as the executive director of Somerset Economic Development Corporation and at the ConnectME authority, the state’s broadband agency. Johnson returned to Central Maine in 2016 after nearly 20 years away working in technology sales at Fortune 500 companies. Jamal Sowell, Gov. Ron Desantis’ (R) pick to lead Enterprise Florida, was previously the chief of staff at the Port of Tampa Bay. An ex-Marine, Sowell also brings experience in higher-ed administration. Jeff Mason, the head of the Michigan Economic Development Corporation, is staying in the position under newly elected Gov. Gretchen Whitmer (D). Mason was previously the inaugural executive director of Michigan’s University Research Corridor, a technology-based economic development program, and served as an executive at MEDC for 10 years. Betsy Markey, Colorado Gov. Jared Polis’ (D) pick to lead the Office of Economic Development and International Trade, is a former U.S. Representative, serving from 2009 to 2011. Since then, she has served in positions with the Department of Homeland Security and as a regional administrator for the U.S. Small Business Administration. Gov. Ron Desantis’ (R) new lead for the Florida Department of Economic Opportunity is Ken Lawson, who will be switching over from Visit Florida, the state’s tourism agency. Prior to joining Visit Florida, Lawson was the secretary of the state’s Department of Business and Professional Regulation. Alicia Keyes, Gov. Michelle Grisham’s (D) appointee to lead the New Mexico Economic Development Department, will shift from her position as film liaison with the city of Albuquerque. Keyes was instrumental in a deal that brought Netflix studios to the state, and previously served as a site selection executive with Disney. Of the 20 new governors, five have not yet named appointees to lead their economic development agencies. The transition group appointed by Connecticut Gov. Ned Lamont (D) is recommending the governor add a cabinet-level “secretary of commerce” position to oversee economic development efforts and coordinate agencies. This position would be in addition to the commissioner position at the Department of Economic and Community Development. The governor-elect has not appointed someone for either role. Due to a bill passed during the state’s most recent lame-duck session, Wisconsin Gov. Tony Evers (D) will not be able to appoint a new head of the Wisconsin Economic Development Corporation until September. Until then, Mark Hogan will remain as the CEO of WEDC. Although Evers has been critical of the agency in the past, he is forming a committee to focus on advancing its entrepreneurship and innovation efforts. In his State of the State speech, Wyoming Gov. Mark Gordon (R) announced a comprehensive review of how the state’s economic development programs are structured. Legislation to set-up ENDOW Cabinet Office & Director was rejected by committee in late November, and it is unclear whether it will be picked up in 2019 Legislative Session. In the meantime, Shawn Reese remains the CEO of the Wyoming Business Council. Georgia Gov. Brian Kemp (R) has been quiet about his plans for the state’s Department of Economic Development. In the meantime, Commissioner Pat Wilson, who was appointed by then-Gov. Nathan Deal in 2016, has remained in the position. Similarly, Nevada Gov. Steve Sisolak (D) has not named a new leader for the Governor’s Office of Economic Development. Sisolak has made economic diversity a key part of his agenda, with an emphasis on encouraging small businesses. Paul Anderson remains the executive director of GOED.